Now that we have Rise of Planet of the Apes out of the way, we can now go over how well it fits into the Planet of the Apes franchise. This is a curious franchise in that it was never intended to be one. As far as the original film was concerned, Planet of the Apes was just a one-time deal. However, the massive success of Planet of the Apes brought an instant demand for a sequel. Somewhere along the way, the story of a world ruled by apes captured the imagination of the public. The succeeding sequels proved financially successful, but more than that, a whole world opened up. 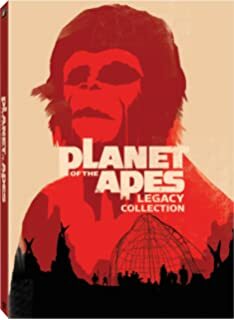 We should remember that Planet of the Apes not only created sequels, remakes, and prequels, but two television programs (one animated, one live-action), along with comic books and more importantly, merchandising. While the original Star Wars trilogy is often credited with opening the floodgates to movie tie-ins like toys and other products, Planet of the Apes I think was the true harbinger (though Star Wars took it to a whole higher level, whether for good or ill I leave up to the reader). In short, I imagine that Pierre Boulle, the author of the novel the film series was based on, could not have imagined this story would take on a life of its own. I think the Planet of the Apes series captured the imagination of people because the setting was both exotic and familiar. It was a world like ours except that the dominant group was now the enslaved one: humanity was no longer in charge, and as Taylor (Charlton Heston) told Dr. Zaius (Maurice Evans) in the original, it was an "upside down world". What the Planet of the Apes franchise also had in its corner is the fact that like all good science-fiction, the authors could talk about taboo or controversial subjects without being blatant about it. The Planet of the Apes franchise is best when addressing contemporary issues. Two of the films (the original Planet of the Apes and Escape From Planet of the Apes) I think do the best job of that. The former manages to discuss such topics as racism, man's ability to destroy himself, and evolution: all while maintaining a high sense of entertainment. The latter was more a satire of early 1970's America: the growing women's moment and the cult of celebrity. However, when it became dark, it become quite sad, a credit to Kim Hunter as chimpanzee Zira and Roddy McDowall as her husband Cornelius. The other films in the series worked up to a point, but they couldn't match the previously-mentioned films in intelligence. I won't lie: of the original five Planet of the Apes film, I've been entertained by all of them. In fact, I would count myself as a fan of the Planet of the Apes series, except for the abysmal 2001 remake/reboot/re-imagining. I found that in my retrospective some were more entertaining than others. I was especially surprised by how good Escape was, both in its wit and humor as well as in the human element (no pun intended). However, while I like them all I am not blind to the weaknesses that some of them have. Conquest of Planet of the Apes has at its heart a good story, but it has the unfortunate situation of being filmed on the cheap (with the end results making the low budget obvious). Still, in its favor is the fact that the actual ape uprising is still quite terrifying. I would fault the filmmakers by pulling back from the apocalyptic ending it was originally suppose to have. If they had kept the ending as intended with no mercy for the humans, it would have made for a better ending. Granted, it would have made for a bleak, depressing, and despairing ending (and also worse, advocated violent revolution as a solution to the problems in America, not a good idea) , but it would have rung true. By pulling back to give humanity some hope, I feel has always been a bit of a cheat--especially since on screen it doesn't look terribly convincing. Battle for Planet of the Apes is also cheap, but somehow it still works and the story does work. It does have the difficulty of attempting to set up the world in Planet of the Apes and it isn't too successful at that, but despite the cheat battle, the film still works. Beneath Planet of the Apes might have worked, and while I still found it entertaining a lot of it was sadly a bit laughable. However, to go to laughable, look no further than the remake of Planet of the Apes. Few films have failed so fiercely and so disastrously that it brought the entire Planet of the Apes franchise to a screeching halt. Now, what about Rise of the Planet of the Apes? Well, I found it to be a hybrid of a prequel and reboot, something akin to Superman Returns (which was not exactly attempting to restart a franchise but not exactly a sequel to Superman II). It could work either way, and I thought it entertaining, with some good things in it, but one too many references to the original Planet of the Apes and an ending that to me didn't signal an uprising of oppressed apes but more a desire for the simians to go back to nature. Now, with no further ado, I present My Rankings of the Planet of the Apes films from Best to Worst. Nothing will really match the original, both in its intelligence (including the truly shocking twist ending) and its action/adventure elements. Escape has a great deal of wit to it as well, so that pushes up in ranking. Battle barely edges out Rise only because I found the story in the former more engaging than the latter, but it was a close call. Rise ranks higher than Conquest purely because it looks better than the other one, and this one was also a close call. If it weren't for how cheap-looking Conquest looks, it would have been a better film. Beneath to my mind is the weakest of the original Ape films and moreover it was a wasted opportunity in terms of a film: the shock is gone, and all that mind-reading business just looks funny and becomes tiresome. Of course, any of these films, actually, almost any film, will be better than Planet of the Apes 2001: just a mess and the only Planet of the Apes film that is not entertaining in any way, not even in camp value.